Despite his looming defeat, EDWIN JUBAHIB, the ambitious former bus conductor who wants to be governor of Davao del Norte, has a future ahead of him. Ranged against Rodolfo “Rodney” del Rosario Jr. in the race for Governor in the coming May mid-term election, Jubahib, aka Kuya Edwin, aka Ugahip, could graduate from being a former bus conductor to become a train conductor. In between if he wins, which is presposterously unbelievable, Jubahib could turn out to be a security guard at the Davao del Norte Capitol. One of Jubahib’s favorite campaign line is that if he wins he would open Capitol to the public up to midnight and that he would be holding office there 24/7. If he holds office 24/7 at Capitol, which is again preposterously unbelievable because he could never win, Jubahib would be acting as the Capitol security guard (SG’s work 24/7, di ba?) to demean the office of the governor. You cannot fault people who say Jubahb is an ignoramus who has no inkling whatsoever on how to run a government office much less the Office of the Governor. His dream to become governor is not only a shot at the moon; It is a ticket to a mental institution. His promise to open Capitol to the public up to midnight and to hold office there 24/7 is funny if not insane. The public transact business with Capitol during the day not in the wee hours of the dawn! Besides, the Civil Service mandates only an 8am to 5pm official work time for government employees. Jubahib could be charged with expropriation of public property if he uses Capitol for his own whim and caprice, beyond mandated office hours for those in government service. Remember Senator Antonio “Trililing” Trillanes who holed himself up 24/7 in his office in the Senate to avoid a warrant of arrest over rebellion charges in 2007? Senate President Tito Toto had said that Trililing expropriated for himself government property and should pay light and water bills. If Jubahib wins, which is again preposterously unbelievable, and orders Capitol employees to work up to midnight and holds office 24/7 in his office, he could be charged for misuse of public property and ordered to pay light and water bills and overtime pay for the Capitol workers! Why do we say that Jubahib is a sure loser? Because his fate is entwined with that of First District Rep. Pantaleon “Bebot” Alvarez, whose own reelection is doomed. Jubahib is the candidate of Alvarez, whose reelection is being contested by Gov. AGR. Rodney is backed by the formidable political powerhouse team of his brother Gov. Anthony “AGR” del Rosario, his father and nmesake veteran politician Rodolfo “RDR” del Rosario Sr, and cousin Second District Rep. Antonio “Tonyboy” Floirendo. 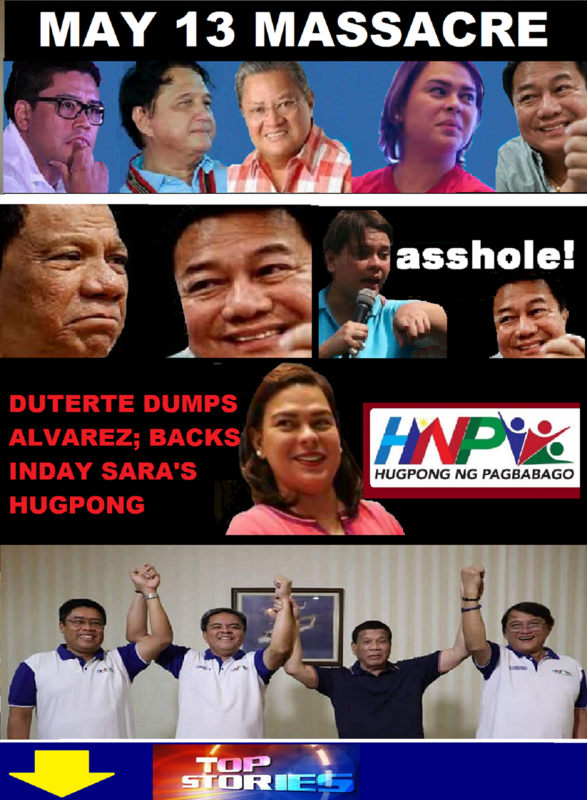 Add to that Davao City Mayor Sara Duterte and her Hugpong ng Pagbabago (HNP). HNP has put up a full slate against the Alvarez Wing of Alvarez. Alvarez’s credility has gone down to the bottom following his ouster in July as Speaker of the House, only less than two years of holding the post over issues of corruption, among others. He has also been called as a “snake in the grass” for fighting the Floirendos and the Del Rosarios despite their having ressurected his political career (Alvarez was a loser in two previous elections against candidates of the Floirendos and Del Rosarios) by helping him win his congressional post in the 2016 election. It is said that Floirendo, who contributed P70 million to the 2016 presidential campaign of then Davao City Mayor Rodrigo Duterte, also convinced President Duterte to have Alvarez named as House Speaker. Alvarez is also accused of deleting, as the then House Speaker, in the national budget development funds for Davao del Norte following a spat with Tonyboy reported as triggered by a public quarrel between their girlfriends. Alvarez, apparently drunk with power as Speaker, made life harder for his former friend and political ally by filing a graft case gainst Floirendo and initiating a House inquiry into a Floirendo company. Alvarez practically positioned himself against one of the sparkplugs of the Davao del Norte economy by questioning the legality of a joint venture between the government and Floirendo-owned giant Cavendish banana company Tagum Agricultural Development Company (TADECO). The deal involved an unproductive reservation area of the Davao Penal Colony that Tadeco developed into a banana plantation that earned millions of pesos in taxes for government and employed thousands including inmates of the penal colony. Tadeco is credited with having placed the province in the map of the world’s biggest banana producers. For decades, the company has been a key player in Davao del Norte’s progress and economic development. Alvarez’s attack on Tadeco and Floirendo is practically an attack against the province’s economy, against businesses linked with Tadeco’s banana production and against the people of Davao del Norte and the thousands of workers employed by the company. If we want to look deep into the sentiments of the Dabaonons, Alvarez could be the most hated persona in Davao del Norte today. It is reported that Mayor Sara played key role in the ouster of Alvarez as Speaker and her apparent anger could doom the ex-Speaker’s reelection, when she invades Davao del Norte to campaign for Gov. AGR, Tonyboy and Rodney and other HNP bets. For all his sins, we should just allow Alvarez to wallow in his political misfortune when the dust of the May polls would have settled down. He deserves it. But let us sympathize with Jubahib, his personal assistant he whimsically lured to run for governor under his Alvarez Wing in his quixotic fight against the political giants of the pprovince. There is still hope in the future for Jubahib, the former bus conductor. His mentor, Alvarez, has been persistentlly claiming that the Tagum-Davao-Digos segment of the Mindanao Railway Transit (MRT) was funded under the General Appropriations Act (GAA) when he was the sitting Speaker. Fact is that credit-grabbing Alvarez has nothing to do with the mega-project, which is being funded by the Chinese government and implemented as part of President Duterte’s “Build, Build, Build” progam. Jubahib has also been repeating Alvarez’s claim so that we suspect he thinks he should get something out of the MRT. Well, when the May poll is over, and Jubahib finds himself jobless, he could apply as train conductor in the MRT on the recommendation of his credit-grabbing mentor Alvarez. As we said Jubahib has a future ahead after the election —- from bus conductor to train conductor!